A public blog for the discussion of algae, phytoplankton, photomicrography, Michael R. Martin's Phytoplankton Image Library, and the images found therein. Has Didymo always been in the rivers of British Columbia? It began with a few small strange patches of slime, clinging to the rocks of the Heber River in Canada. Within a year, the patches had become thick, blooming mats. Within a few years the mats had grown into a giant green snot. And within a few decades this snot had spread around the world, clogging up rivers as far away as South America, Europe and Australasia. This snot, which is still flourishing today, is caused by a microscopic alga, a diatom that goes by its scientific name Didymosphenia geminata. It has become so notorious it has its own moniker, Didymo. People have been blamed for the sudden, global explosion of this tiny organism, unwittingly carrying the algae from river to river on fishing gear, boats and kayaks. The huge snots it forms have wreaked havoc in waterways, forcing governments and environmental organisations to initiate huge and costly clean-up operations. But underlying the snots’ strange appearance is an even stranger story. About Didymo itself, about what it is, and how it behaves. Scientists are now discovering that the sudden appearance of Didymo may not have been so sudden after all. River users are told to help stop Didymo. Its blooms aren’t really blooms – instead they are more of an elixir-induced metamorphosis. And Didymo seems to ignore the usual rules followed by invasive species. It even appears likely that this little diatom may not even be a significant problem itself; instead the green snot it forms may be a symptom of greater changes underway in freshwater systems around the world. Rock snot, a slimy-looking algae that vexes salmon and salmon fishermen, is not an alien invader but a homegrown threat gaining strength in changing water conditions, according to a new study by scientists from Dartmouth and Environment Canada. Officially known as Didymosphenia geminata, which scientists shorten to didymo, it has existed in portions of Alaska for some eight centuries, said the study published online last week in the journal BioScience. Only recently, though, has the nuisance algae been noticed, even in sites considered pristine, thanks to aggressive growth that spreads rock snot stalks in lakes, rivers and streams. "It's in Patagonia. It's in Tierra del Fuego. It's in Alaska," said study co-author Brad Taylor of Dartmouth College. It is also in British Columbia, New York and various northeastern U.S. states. Sweden, Poland and Colorado see it, too. Alaska officials have waged a crusade against rock snot. Alaska is among several states that ban felt soles in fishermen's waders; the state Department of Fish and Game cites felt's ability to absorb and transport a plethora of unwanted organisms to new places. The Alaska House this year passed a bill that allows state officials to mount a rapid response to eradicate invasive aquatic species and establishes a fund to pay for it; the bill died, however, without Senate action. But when it comes to combating rock snot in Alaska, anti-invader strategies may do little, according to Taylor's study. Core samples at Naknek Lake show that rock snot has been there since the year 1200, the study notes. As long as the didymo did not bloom, Taylor said, it went mostly unnoticed. "Unless you scrubbed a rock and looked in a microscope, you would never know it's there," he said. "Absence of evidence was used as evidence of absence." 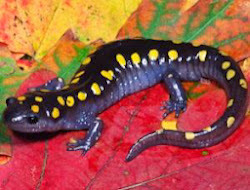 The spotted salamander (Ambystoma maculatum) is found throughout the eastern USA and parts of southern Canada. While a number of animals, including corals, sponges, sea slugs and one species of hornet have algae living in them that use sunlight to make sugar, no backboned animal has been found that can harness the sun – until now. It has long been suspected, and now there is hard evidence: the spotted salamander is solar-powered. Plants make food using photosynthesis, absorbing light to power a chemical reaction that converts carbon dioxide and water into glucose and releases oxygen. Corals profit from this reaction by housing photosynthetic algae inside their shells. Spotted salamanders, too, are in a long-term relationship with photosynthetic algae. In 1888, biologist Henry Orr reported that their eggs often contain single-celled green algae called Oophila amblystomatis. The salamanders lay the eggs in pools of water, and the algae colonise them within hours. By the 1940s, biologists strongly suspected it was a symbiotic relationship, beneficial to both the salamander embryos and the algae. The embryos release waste material, which the algae feed on. In turn the algae photosynthesise and release oxygen, which the embryos take in. Embryos that have more algae are more likely to survive and develop faster than embryos with few or none. To find out if that was happening, Erin Graham of Temple University in Philadelphia, Pennsylvania and colleagues incubated salamander eggs in water containing radioactive carbon-14. Algae take up the isotope in the form of carbon dioxide, producing radioactive glucose. Graham found that the embryos became mildly radioactive – unless kept in the dark. That showed that the embryos could only take in the carbon-14 via photosynthesis in the algae. The algae do not seem to be essential to the embryos, but they are very helpful: embryos deprived of algae struggle. "Their survival rate is much lower and their growth is slowed," says Graham. Splitterwerk Architects have designed an algae powered building, dubbed BIQ, which will be the very first of its kind. Covered with a bio-adaptive façade of microalgae, the distinctive building has been designed for the International Building Exhibition in Hamburg and is slated to open this month. All words and content copyright © Michael R. Martin 2004 - 2008. All rights reserved. Please ask for permission before use or reuse.